Of all the beautiful islands in this world there are few that can match the beauty and beaches of Silhouette Island, Seychelles. A tiny island, lost in oceans of blue. 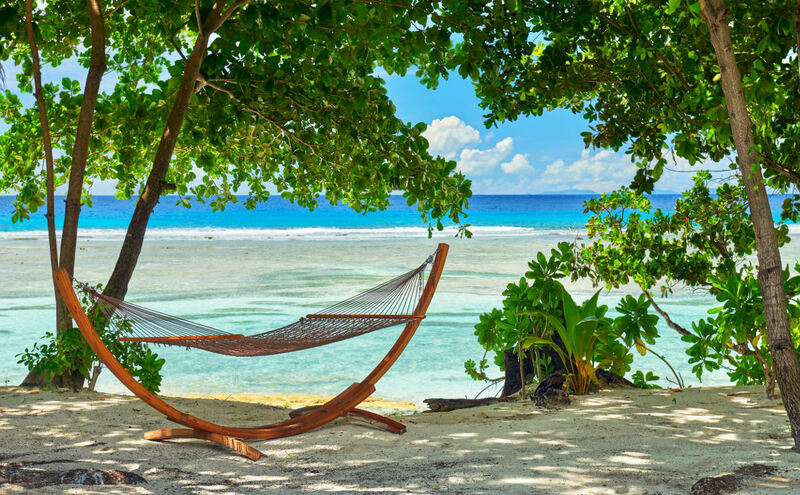 Far from anywhere, where the cares of life seem to magically melt away the moment you step onto its verdant shores. 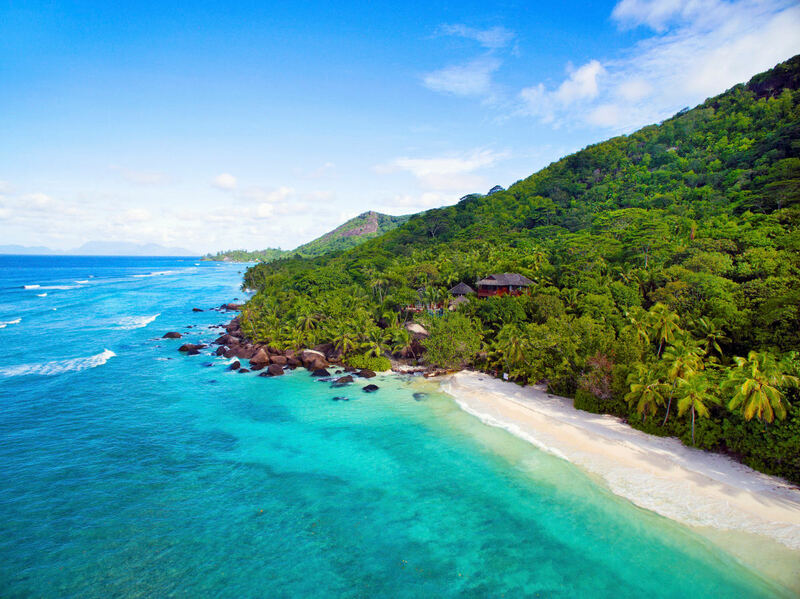 With only a little over a hundred inhabitants, on a fairly big island (it's the third biggest of the over 100 islands that make up the Seychelles archipelago), you'll have the place almost to yourself. There are no cars either and only one tractor. There is only one resort on the island. 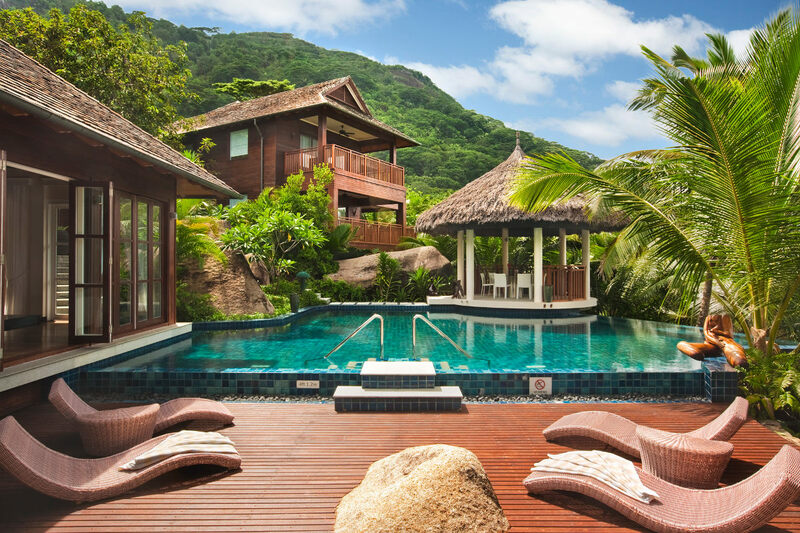 The world famous Hilton Seychelles Labriz Resort & Spa - one of the best of the many Seychelles beach resorts. 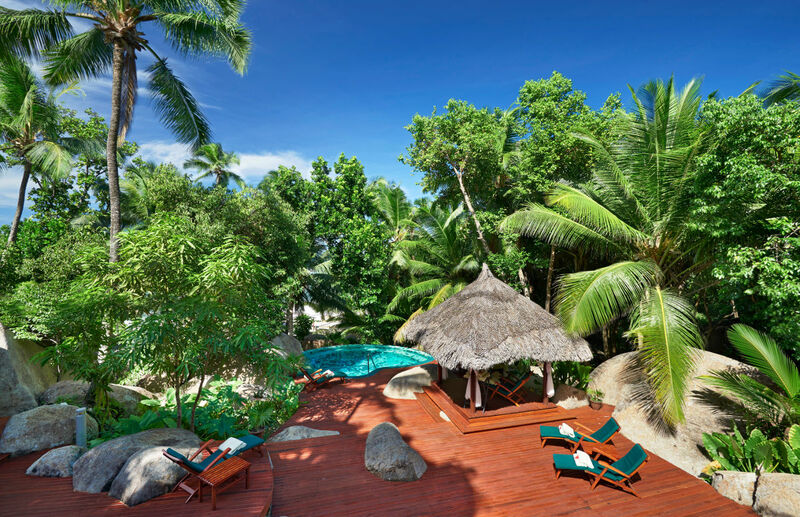 The resort is made up of eco-villas, each one nestled in the jungle and all of them a short walk from the beach. A special experience is one of the Creole dinners on the veranda of the old plantation house, which dates back to 1860. Embraced by the warmth of a summer evening in the tropics, with the fragrances of tropical flowers drifting on the gentle breeze this has to be one of the most romantic dinners you'll ever experience. La Passe is the beach nearest to the hotel. Its shallow and calm waters, protected by a reef, make it the perfect beach for children. Snorkeling is possible, although snorkeling from the beach isn't as good as on some of the beaches of Praslin Island. On Silhouette itself Anse Mondon is the best snorkeling beach. Grand Barbe beach is much wilder and more spectacular. You'll need to hike for three hours across the island to the beach, where you might well see turtles towards the end of November until February. The beach is beautiful and very different to La Passe on the east coast, here there is nobody else and nothing else. Once there was a village but no more - all the inhabitants have left for other places. You'll see the abandoned wooden houses which are now being reclaimed by the forest. Beware - the currents can be strong so it's not a great beach for swimming or snorkeling. Anse Mondon is the best beach for snorkeling and swimming and probably the most beautiful of all the island beaches. Its a four hour walk through the forest though. Once you return from the island please leave a comment at the bottom of the beach letting me know which beach you liked best. If, for some strange reason, you'd like a break from the beaches then most of the villas at the resort have their own pool. If yours doesn't then there is a spectacular swimming pool for all guests to use. Really any time is a good time. Our climate guide has more on what to expect. Inter-Island Ferry: Costs 99 Euros a person for a return ticket (children half-price) and leaves three times a day. Private Boat Transfer: 650 Euros each way and can take up to six people. Helicopter: 638 Euros for up to four passengers. If you have lots of luggage maybe only three people can fly. Going by boat and are not used to ocean boat trips? Take something for motion sickness. The trip only takes 45 minutes but it can get a little rough at times.